Ed and his crew worked extremely hard on a recent project of mine. The very-hard-to remove-paper didn’t phase them one bit. Good work.Reasonable price. You can’t go wrong hiring Blue Sky. I just had Ed and Ying out to my home to wallpaper my kitchen with a faux brick paper. OMG it looks amazing! The customer service is outstanding and the work a 10 +. I would highly, highly recommend them!! Ed was highly recommended to me by a couple of realtors who have used him for various jobs. He did a very professional job for me , removing painted over wallpaper which had about 3 additional layers under it. He then prepped, sanded, caulked and painted two bedrooms ,ceilings and trim and did an amazing job. He was very prompt and timely with the work. Left everything clean and in good order. Would highly recommend him and certainly would use his services again. Ed and his wife did a fantastic job removing the wallpaper border in my kitchen/dining room. They came in and went right to work and had the job finished in an hour. Because the job went easier than expected, Ed reduced the charge by $100.00! That kind of integrity is hard to find these days. I highly recommend Blue Sky Paper Hanging! We are a NYC based interior design firm and were referred to Blue Sky through a Portland contact. Working on a long distance project has its challenges, not only was Ed Kuchar professional with his work commitment and punctuality, he provided me with daily updates and pictures for review. He was skilled and meticulous with a particularly difficult wall covering. The end result was executed beautifully. As designers, we expect good quality and care with the trades we work with, and it makes our job to please the client an easier one. We look forward to working with Blue Sky in the future. Blue Sky is the best. From the first phone call to completion of the room – Ed was extremely professional and friendly. He is tedious and takes the time on the front end to ensure he goes into the project on install day fully prepared. 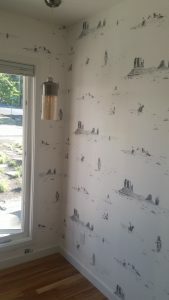 The paper we used was not a traditional or simple type, and there were some surprises on install day, however Ed and his wife got the job done beautifully in a timely manner. They are perfectionists and stayed in constant communication as issues with our paper arose. I would highly recommend Blue Sky for wallpaperhanging. 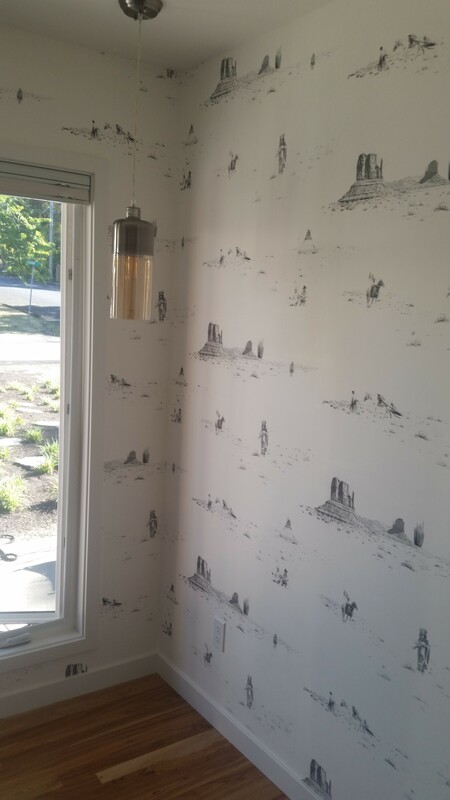 The wallpaper hanging and painting job you have done in our office looks absolutely incredible !! With our new wall paper and paint, I say thank you for your neat and clean paperhangers….. 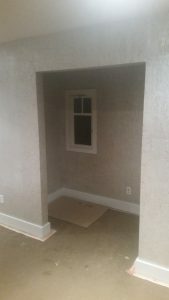 Your paper hanger and painter did the utmost job at wall paper hanging & painting. He changed my extra bedroom into a beautiful office and it looks absolutely incredible with our new wallpaper and paint!!! Your painters and wallpaper hangers were so respectful, quick, and clean. It was such a great experience that I will definitely use Blue Sky again next time I need another room painted.